The FAST procedure is a minimally invasive treatment designed to remove the source of tendon pain. "One of our ASC customers, in Oregon, report-ed savings of $17,000 on implants and associat-ed costs on their first 10 cases." Highest quality joint replacement im-plants and instrumentations with the greatest assurance of long-term clinical success. The ideal Matrix for Bone Regeneration. "Hospitals can reduce autograft harvesting proce-dures as well as purchases of expensive bone mor-phogenic proteins." 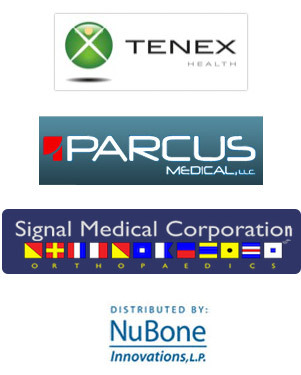 PTY Medical Group is a premier distributor for TENEX Health, PARCUS Medical, SIGNAL Medical and NuBone. We also offer a variety of medical supplies and services to healthcare providers.